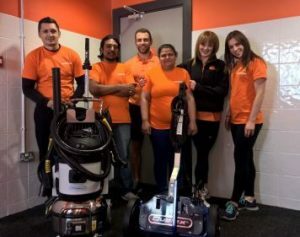 Our picture shows members of the team at Easy Gym in London’s East Ham who recently took delivery of a Duplex 420 Steam and Jet Vac Ultima cleaning machines. Easy Gym’s George Taylor said “Although we are a low cost budget gym, we believe in maintaining a high standard of cleanliness throughout all our clubs. Therefore we are currently trying out Duplex machines as we were convinced by Duplex that with their machines price, training and back-up service we will get the job done allowing our members to enjoy their experience at our clubs leaving us a happy customer. These Machines are Brilliant ! From Mo !